Known as an American classic, here’s everything you need to know about the world of split-rail fencing. A split-rail fence features wooden posts with up to four rails running between them. The most basic style is known as the standard. Two or three rails are used, depending on the height and use of the fence. The posts of this style are rarely capped to maintain its simplicity, and sometimes round rails are used that resemble posts. To play with the style, some people choose to cross the rails, creating the crossbuck style. It features a top and bottom rail with an X-shape in between. The third style is known as the stacked fence. Cedar or rustic logs are often used in this style and instead of posts, the rails are stacked on top of each other in a zig-zag formation for added stability. The main, classic material used for split-rail fencing is wood. Most often, you’ll find these fences constructed with cedar, oak, or pine. In many cases, builders use stained wood to show off the natural grain better while others choose to paint or whitewash the wood. Because of the rustic nature and style of split-rail fencing, builders often opt to use a rough-hewn board or even logs that have bark left on. These details add to the appeal of this fencing. For people that like the look but not the maintenance, they often use vinyl panels in place of the wood. 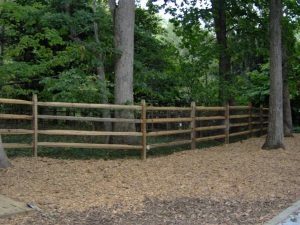 Split-rail fencing often serves the same purpose as picket fencing or chain link. It’s a useful way to mark your property lines without disrupting your view. It can also be used on larger properties to separate certain sections from others, according to how it’s used. Although they wouldn’t be the most efficient choice for privacy or security, they do add a beautiful rustic style. When using a gate with split-rail fencing, the best idea is to find an option that most closely matches the style of this fence. Traditionally, the gate for this style will also be split-rail in design and feature a diagonal or crossed rail. Hercules Fence Northern Virginia has countless fencing options for your home and commercial property. Whether you’re excited about a beautiful vinyl chain link fence or already planning out your custom wood commercial fence, we are ready to help you frame and secure your property. Hercules Fence Northern Virginia has been providing homeowners with quality fences for over 50 years. We are well equipped to meet your needs, whether they are residential or commercial. Contact us to see how a beautiful wood fence can protect your property by giving us a call at 703-551-2609 or visiting us online. To see examples of our work, follow us on Facebook, Twitter, Google+, LinkedIn, Pinterest, and Flickr. This entry was posted on Friday, May 25th, 2018 at 3:11 pm. Both comments and pings are currently closed.